The Purge God Anarchy Movie made from hard plastic for sale. This Purge dress up mask comes with an elasticated strap so one size fits all. This quality Purge Cosplay fancy dress Mask is made from thermo plastic. Order now for just £21.99 with next day delivery and international shipping available. 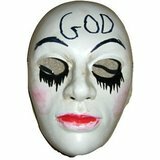 Notify me when "The Purge Anarchy - God Mask Halloween Cosplay Hard Plastic" is re-stocked.